The orthodontic supplies market is expected to witness a CAGR of 7.8%. The demand for orthodontic supplies market is on a surge, mainly due to increasing prevalence of the oral diseases. The number of the people opting orthodontic procedures has been increasing from the past few years. According a new survey from the American Association of Orthodontists (AAO), the number of adult patients has increased from 14% in a 2-year period, from 2010 to 2012, and has reached a record of 1,225,850 patients in 2012. The orthodontic procedures performed for the patients in the age-group of 17 years and below, were around 4.6 million, while the total procedures were 5.8 million, in 2012. Based on these statistics, the number of the orthodontic patients is increasing which leads to the increment of orthodontic procedures. Hence, the need for orthodontic procedures is expected to drive the orthodontic supplies market, globally. 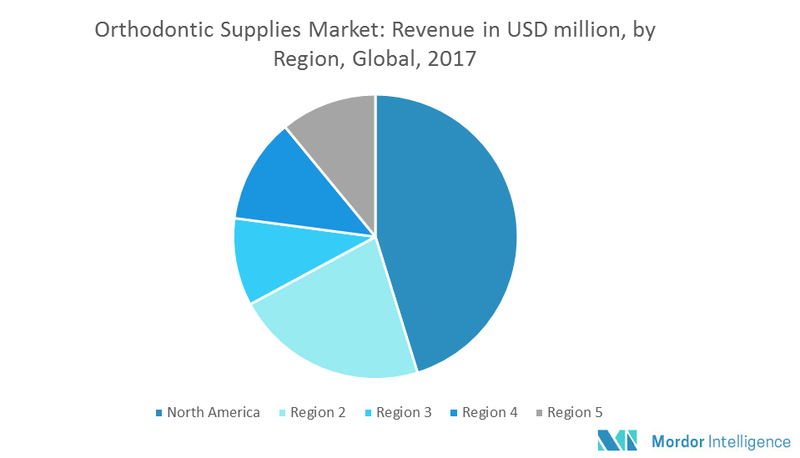 The other factors that are contributing toward the growth of the global orthodontist supplies market include, increasing technological advancements and high DMFT index, along with increasing awareness of orthodontic procedures in the developing countries. Orthodontics have the potential to cause a serious damage to both hard and soft tissues, during or after the surgery. There are many complications that are involved during the procedures, which leads to certain oral damage. For instance, Archwires, headgears and brackets can cause a lot of damage, either during an active phase of treatment or the dental debonding, if not performed properly. The complications that can occur during appliances placing procedure is because of the careless use of a band seater, which can lead to enamel fracture. Debonding can also lead to enamel fracture, both with metal and ceramic brackets. Root resorption is another problem, which can affect the patient’s oral health. In addition, people hesitate to wear the braces and other orthodontic appliances, due to the loss in their facial and aesthetic appearance. However, there is a demand for new advancements such as Invisalign technology, because of its invisible and safer treatment procedure, used in conventional orthodontic treatment, which is affecting the sale of braces, bands, archwires, etc. These are some of the factors hindering the growth of orthodontics market, globally. Also, factors such as, poor reimbursement policies are hindering the growth of the market. North America has the largest market share, with the United States being the larger contributor when compared to Canada. The North American orthodontic supplies market is mainly due to the high prevalence of the dental disorders, along with the increasing urge in people to look better, aesthetically. However, the Asia-Pacific region is also expected to grow in the future, due to the growing number of the orthodontic/dental companies. November 2017: American Orthodontics launched the BracePaste medium viscosity light curable adhesive. It provides optimum bonding of both metal and ceramic brackets, and is designed to minimize bracket drift and provide easy flash cleanup. Major Players: 3M Unitek Corp., Align Technology Inc., American Orthodontics, BioMers Pte Ltd, DB Orthodontics Ltd, Dentsply Sirona Inc., G&H Orthodontics Inc., Great Lakes Orthodontics, Ltd, Ormco Corp., and Ortho Organizers Inc., among others. 9.8 Great Lakes Orthodontics Ltd.